This semester, I’m taking a photography class. During one of my weekend excursions to Raleigh, I grabbed my friend, Bruce, and drug him to an old (slightly sketchy), abandoned warehouse for a photo shoot. Not to be outdone, he insisted on taking some photos too. 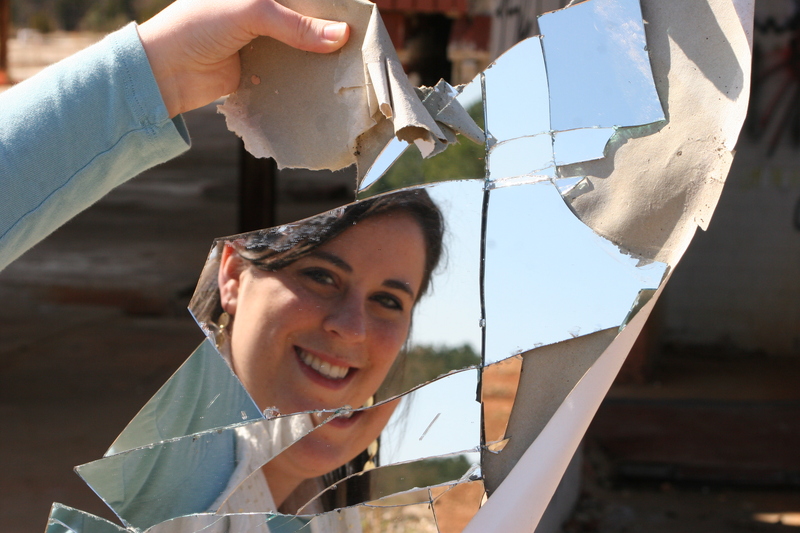 We found this smashed mirror on the ground, and got some really good pictures with it. This is one of my favorite ones that he took of me. Not only is it a decent picture, but it also symbolizes my life right now. Like this mirror, I feel like I’m broken. I’m tired — no, I’m exhausted. I’m too busy. I’ve had too many late nights with not enough sleep. I have a million things to do, between school, work, my internship, applying for jobs, putting together a portfolio, traveling and (sometimes) attempting to throw sleep in there. I’m worried and stressed. I graduate in 17 days, and my life doesn’t look at all like I hoped or planned it would two and a half weeks before graduation. I have no job — I don’t even have prospects on one. Most of my friends have accepted job offers or have their plans for graduate school all lined up, but me? Nope. I’m the lame-o that’s moving home indefinitely after graduation. I have big dreams, and I don’t know if I’m shooting too high for a new college graduate or if I just need to be more patient. Not only that, but the Christian university mantra of “ring by spring” didn’t work either. No husband. No fiancée. Nope… not even a boyfriend — and, yet again, no prospects. It seems like every time I turn around, so-and-so got engaged and so-and-so is pregnant and so-and-so finally started dating that boy she’s liked for months. While I’m incredibly happy for each and every one of those friends, it’s hard not to accidentally let the big green jealousy monster creep into my heart from time to time. I feel like a failure: I’ve fallen short of practically all of my goals, I’m an awful person and my pride is broken. I’ve allowed these failures to cause me to worry. I’ve turned my attention inward and begun focusing on selfish desires. The worst part is, I’ve let all these things choke out my time for Jesus. Over the past week, however, I’ve really worked to realign my heart and mind with Christ. It’s a process, but I’m coming along–slowly, but surely. Throughout all this, God has shown up and saved the day. I may not know what lies ahead, but He’s completely turned my attitude around and everything is hunky dory. However, I’m going to be perfectly honest: I HAVE really worked to realign my heart and mind with Christ, and it IS a process… a very slow and sometimes not so steady. I’m still tired. I’m still worn down. I’m still worried. Something I have always struggled with is the difference between having a “head knowledge” and a “heart knowledge” of all things God-related. For example, I know He is [fill in the blank with your favorite “God adjective:” sufficent, sovereign, good, etc. ], but often times, I don’t feel that way. I’ve been listening to Together for the Gospel Live II on repeat for the past few days, and there’s this one verse in “I Hear the Words of Love” that really sticks out to me. No change my Savior knows. Even though I change, Jesus doesn’t. So, even though I’m fighting that same inward battle once again, I’ve made the conscious decision to cling to my never-changing Savior with every fiber of my being. It may not seem like it now, but just like Bruce used the broken mirror to create a creative and beautiful work of art, I know that God will create something beautiful out of my brokenness. Until that happens, I will wait and trust in Him. This piece was written for my Techniques of Media Writing class at Gardner-Webb University in the fall of 2011. It is an editorial column. Here is the link to the news story it’s based on. Just a few days ago, the hash tag #ThingsLongerThanKimsMarriage was trending on the popular social networking site, Twitter, in response to Kim Kardashian’s announcement that her 72-day marriage was ending in divorce. When looking for something to write about, Kim Kardashian was not at the top of my list. I do not follow the Kardashian drama on MTV and I do not care to buy any of the Kardashian products. I do not consider myself fashionable or at all up to date on pop culture. However, when a friend suggested that I write about Kardashian’s divorce, the wheels started turning. I may not be passionate about the Kardashian clan or any of their publicity stunts, but I am extremely passionate about marriage. With a “quick fix” so easily available, couples often fail to consider all the ramifications of a divorce. Divorce is expensive. The average divorce in America costs $20,000—that doesn’t even include child support and alimony. Another heavy consequence of divorce is the emotional trauma it causes the individuals involved. This doesn’t just apply to the couple, but also their children and sometimes even their close friends or family. Children should not be punished for their parent’s poor decisions. Unfortunately, when parents go their separate ways, children are left lurching in the middle. They are often plagued with guilt or loneliness. They can think that they are the reason that one of their parents left or that the parent that left is abandoning them. Children that come from families with broken marriages are more likely to experience broken marriages themselves. This can point back to the fact that they may have never had a successful marriage modeled for them and also that they are more likely to see divorce as a normal occurrence. My biggest issue with divorce is that I believe that your integrity is one of the most important things one can possess. Marriage is not something to be taken lightly. When you say “I do,” you are making a vow—a forever promise—“for better, for worse, for richer, for poorer, in sickness or in health, to love and to cherish, ‘til death do us part.” Divorce blatantly breaks that promise and makes a liar out of those who made the vow. If we’re making that kind of permanent promise, we should put some serious thought into whether or not the person we are considering marrying is someone we can spend the rest of our life with—because that is the promise we are making. Mutual trust and intimacy are key to a marriage that lasts. While physical intimacy is certainly an aspect of a healthy marriage, exclusive, emotional intimacy is crucial as well. True intimacy comes when there are no secrets and you are truly vulnerable with your spouse (or spouse-to-be). This is why it is vital that you don’t rush into a marriage, you have to work up to this level of intimacy and trust.